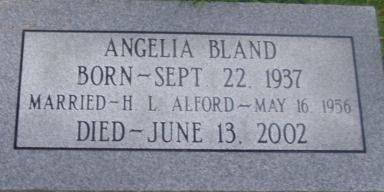 MABEN [Webster Co.]—Angelia Bland Alford, 64, homemaker, died Thursday, June 13, 2002, at North MS Medical Center in Tupelo [Lee Co.]. Services are 10 a.m. Saturday at Oliver Funeral Home with burial in the Marvin Hill Cemetery in Cumberland. AAFA NOTES: SSDI records show that Angelia B. Alford (SS #428-72-0248 issued in MS) was born 22 Sept 1937. We included the obituary of her husband, Howard Leslie “H.L.” Alford, in Mississippi Obituaries. 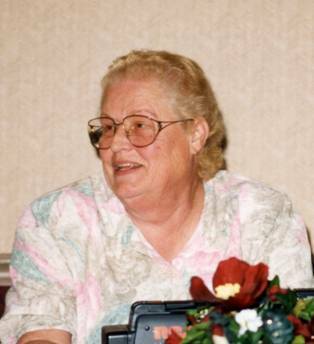 Angelia, her husband H.L., and their son Ken attended several annual meetings. Her husband's lineage: Howard Leslie 1932 MS1, Osie Lee 1896 MS2, James Thomas Monroe Pinkney 1855 MS3, Monroe 1826 AL4, Littleberry 1801 NC5.